Megan & Andrew exchange vows amongst a gorgeous overlook of the Pacific coastline. A beautiful sunset wedding on a beach in Cabo San Lucas. An elopement in the mountains of Colorado. The story of how Mia & Henry met and fell in love – shot overlooking the Golden Gate Bridge. A beach wedding + sailing trip in the U.S. Virgin Islands. We are Brad & Monica – wedding & elopement filmmakers based out of Dallas / Fort Worth. We are based in Fort Worth, Texas, but often travel for our weddings. We don’t charge travel fees, so wherever your wedding is – we want to be there! 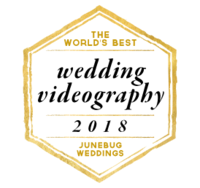 We do accept a limited number of bookings per year, so please let us know of your interest as soon as you begin your videographer search.